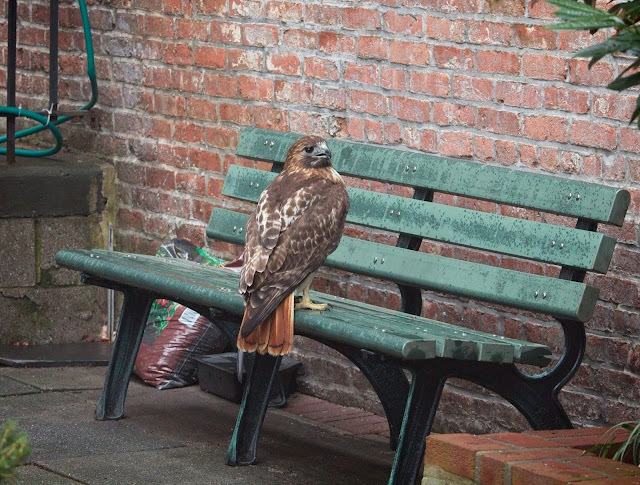 I was hoping to have some happy news about Christo and Dora brooding eggs, but the last few days have seen some drama in Tompkins Square and our beautiful red-tailed Dora has been taken to rehab. On Tuesday, I went to the park at noon where I saw Dora up in the nest displaying classic brooding behavior. She was down in the nest, tail sticking out, and remained still. At 2pm, Christo flew in and they made a nest exchange, which pretty much confirmed that they were sitting on eggs. Christo took over brooding while Dora flew to the roof at St Brigid's church and rested for about an hour. She also ate some food that had been stashed there. Dora then flew back into the park, but stayed in the trees rather than returning to the nest. At 4pm, Christo came out of the nest to mate with Dora, then he returned to the nest while she stayed in the trees. They mated again at 4:35pm and 6:25pm. 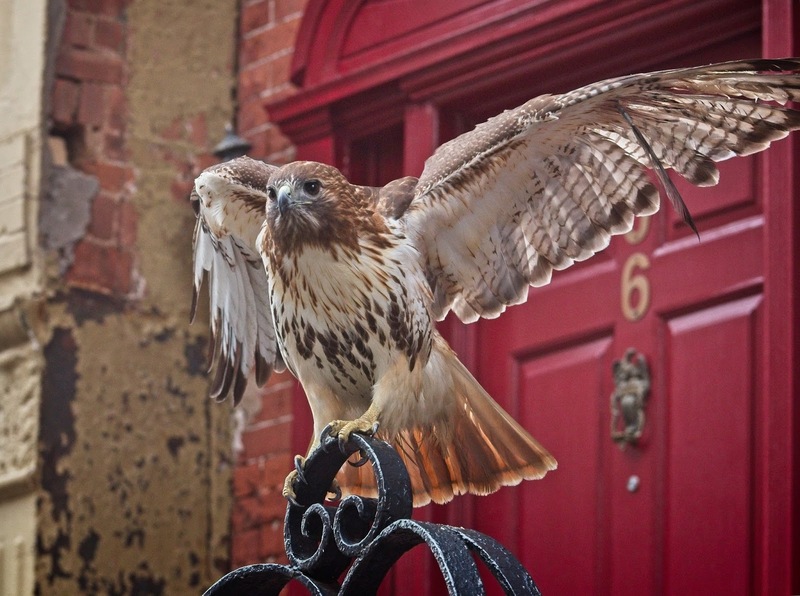 I stayed with Dora until 7:20pm when, instead of returning to the nest to roost, she went to a fire escape on 9th Street. I was extremely disappointed to see this as it meant she was not incubating the eggs. By this time I had lost track of Christo, so it's possible that he stayed on the nest for the night, but it would be very unusual for the male to do that. 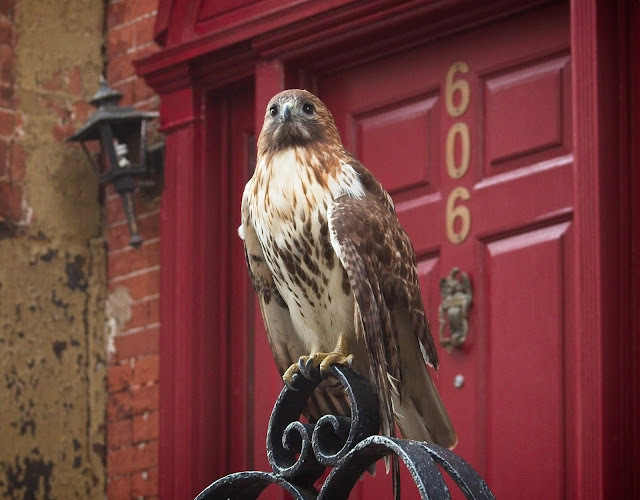 This morning (Wednesday), I received a call from a fellow hawk-watcher who said Dora was low on a gate on 9th Street, very close to where she had roosted the night before on the fire escape. It's not normal for Dora to be this low to the ground, and it was obvious she was having trouble flying. Dora's original injury from November 2017 had healed. 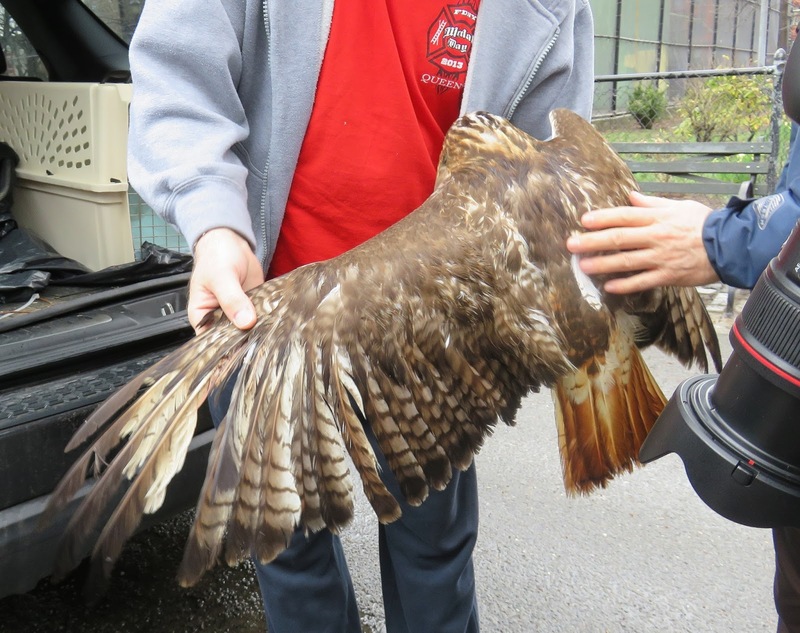 When she was released into the park on February 26, she was in good shape and, since then, she has made a lot of progress and was able to fly up to the 20+ story Village View buildings on First Avenue. However, she suffered some trauma over the last few days including a broken blood feather on her wing, and engaging in a physical fight with another hawk on Monday. A large crowd of people gathered on 9th Street, which spooked Dora and she tried to fly across the street to the park. Instead, she crashed into a cab, ended up on the sidewalk, then ran through the fence to shelter in the yard at Trinity Church on the corner of Avenue B and 9th Street. The church was nice enough to clear the yard of people so Dora could rest. While we waited for rescuers to arrive, Dora climbed up a tree. Animal Care and Control arrived, as well as Rob Mastrianni from the NYC Urban Park Rangers. 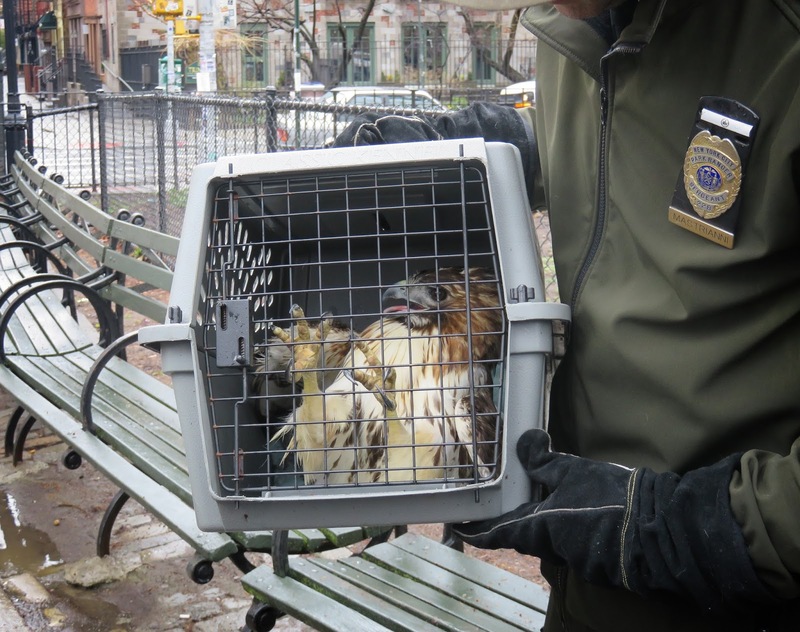 Rob has rescued many hawks in the city, including one of Christo and Dora's fledglings who got trapped in an air shaft on this same block back in 2014. As Dora was fairly high in the tree, this made catching her difficult. In the video below, Eva from ACC tries to lasso Dora. The rainy weather didn't help either. 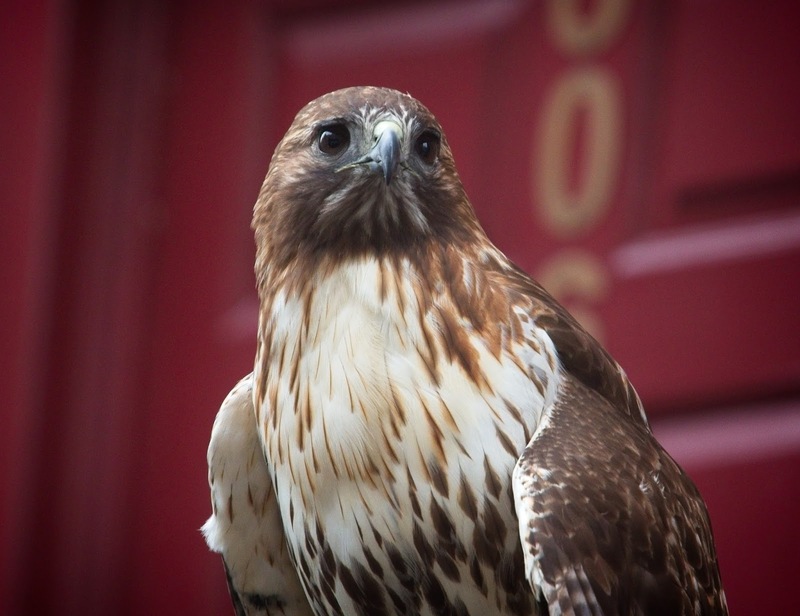 After several attempts to nab Dora at Trinity, she managed to fly across the street to the basketball area of Tompkins Square. Despite being fairly low on a fence, she still evaded capture. After running along the fence to the pool, Dora flew into a tree where I thought she'd be out of reach. However, Eva didn't give up and climbed a wall to try an net her. To make things more complicated, Christo flew in and mated with Dora during the rescue attempt! Eventually, Dora became tired enough to finally get netted. After Dora was successfully captured, Bobby Horvath from Wildlife in Need of Rescue and Rehabilitation (WINORR) arrived to examine her. Dora's wing is not broken, but Bobby took her into his care to assess her health and give her some rest. Although I was sad to see Dora return to rehab, I am relieved she is in the care of WINORR and trust them to take care of her and do what is best for her. As Dora was being taken to the car, Christo was watching from atop the Christodora. Then someone noticed a hawk in the nest! I ran over to check it out and, sure enough, another hawk was messing around in Dora's nest. As if that wasn't shocking enough, Christo mated with the new hawk! I took photos of the New Girl and confirmed it is NOT Barucha/Nora. 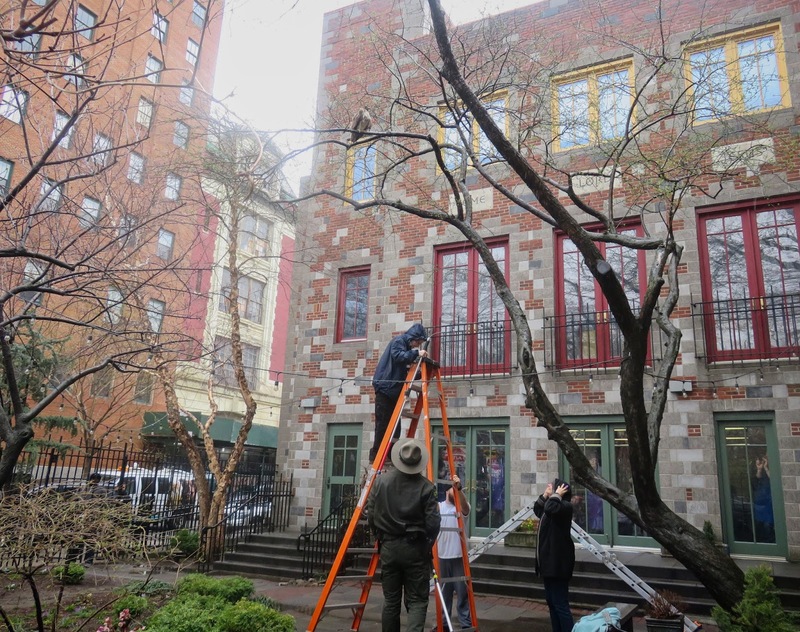 I then remembered that, as I'd headed to 9th Street to see Dora this morning, I saw a hawk perched on Village View on First Avenue, and I also saw Christo in the nest a few minutes later. 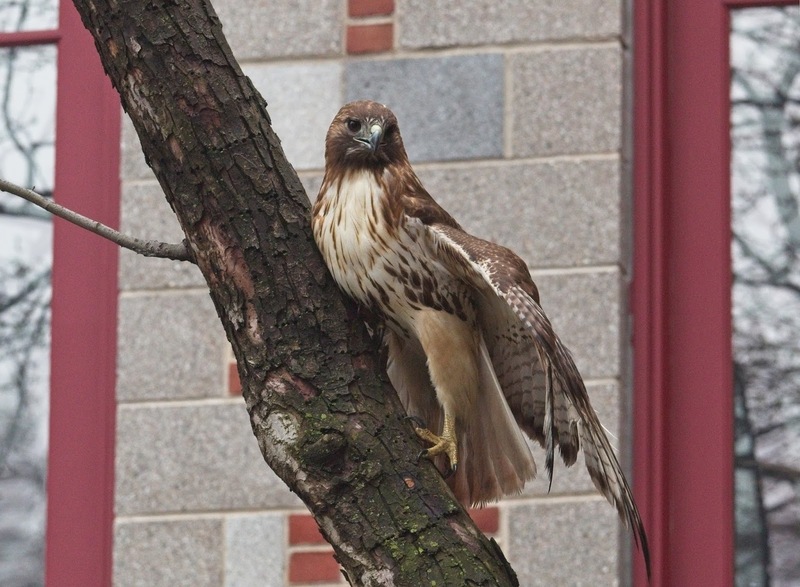 So, was the hawk on Village View this new female waiting to make her move? Was it the same hawk Dora fought on Monday? I'm certain there were eggs in the nest on Tuesday. It's possible those eggs were left unattended too long and became unviable. If Christo (or the new hawk?) sat on them last night, it's possible they could survive. After what I saw today, I am thinking there could definitely be new eggs for Christo and the new female. Time will tell. I spent the rest of the day with Christo and the New Girl. I took a lot of photos and will post them once I process them. There has been so much going on, it's hard to keep up. A big Thank You to Eva from Animal Care & Control who worked tirelessly today to capture Dora. Thanks also to Ranger Rob, and to Bobby and Cathy Horvath who are again stepping up to help Dora. 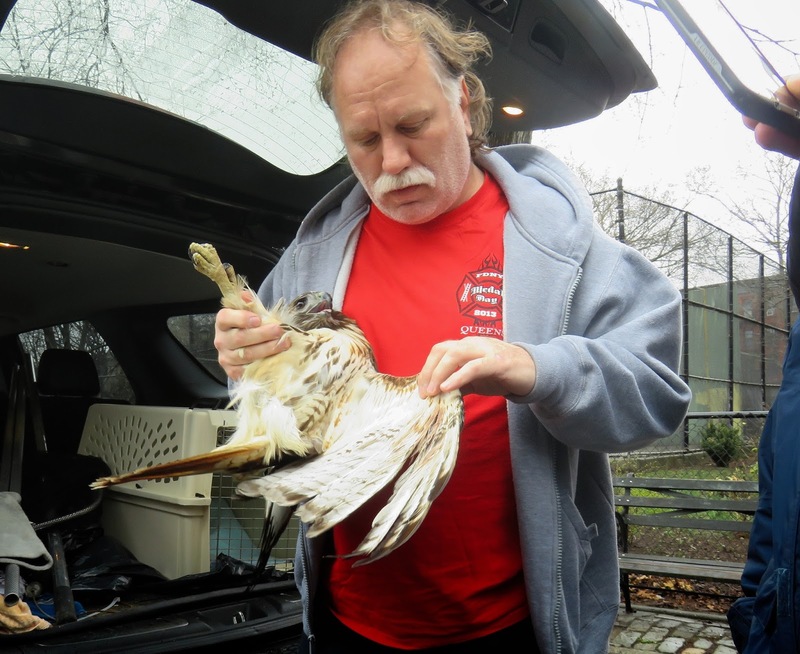 They care for our NYC wildlife out of the kindness of their hearts and do not receive any type of funding, so please consider making a donation to their efforts.